Being back in Greece again is absolutely wonderful, and I’m full of new cooking inspiration! I can’t wait to post about what I’ve been up to, but until then I’ll leave you with these “delish” brownies! These brownies get their title from my Grandmother, who thought that they were positively “delish”. Anyway, these are quick and easy and probably one of the best brownie recipes because they would be impossible to mess up, and finally, because, well, they’re Martha Stewart’s! I’ve made these a few times, and have therefore made a few adjustments to the original recipe. Preheat oven to 350 degrees. Line a 8-inch pan with parchment paper, and grease the parchment paper. Melt butter, chocolate and cocoa in a heatproof bowl over a pot of simmering water. Stir together until melted. Once melted, cool slightly. Whisk together the flour, baking powder and salt in a bow, and set aside. Beat sugar, eggs and vanilla in a bowl with an electric mixer for 4 minutes. Add the melted chocolate mixture and beat until combined. Add the flour mixture and beat, scraping down the sides of the bowl until completely combined. Pour batter into the prepared pan and bake until a cake tester comes out with a few crumbs (but not wet! ), which takes about 35 minutes. Let the brownies cool in the pan for about 15 minutes and then lift out the brownies using the parchment paper. Let cool completely before cutting into squares. So there you go, the perfect brownies! If you feel like adding in some extras try adding in some nuts, or chocolate chips. « Berry Good Banana & Blueberry Smoothie! 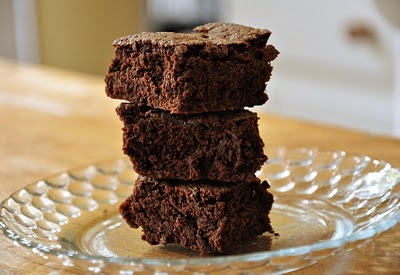 These brownies are absolutely "delish"...I tried them at Miss Living Lou's home...I have never made a brownie this good...I am totally intimidated by baking brownies but I will try this recipt as it is fabulous & was made without effort...Good Job, Miss Living Lou! YUM!! I'm still looking for a brownie recipe and I think I need to try this! Oh gosh, I completely didn't realize that was missing! So sorry, it's 1/4 cup of cocoa powder! I've fixed that now, thanks for letting me know. I never have an 8x8 pan... 13x9. What does this do for the recipe? Help! Hi Mary-Rose, the brownies will just be a bit thinner. I would recommend that you try baking them for about 25 instead of 35 minutes and then checking to see if they are done. Let me know how they go!